Newly hatched, yellow baby chicks are adorable and lovable. If you are looking to grow a pet flock, chicks are always a safe bet. Once they grow up (two months older), they don’t require much attention, especially as far as feeding is concerned. They graze outdoors and fulfil their water needs themselves as well. However, during the first eight weeks of their birth, baby chicks require constant care. Creating a suitable living environment is the most important part of raising healthy chickens. Newly hatched chicks should be placed in a warm place, so a garage or a basement makes an ideal place for your baby chicks. However, you can shift your chicks to an outside coop at 4 to 5 weeks of age. Also make sure that you keep them in a place that is safe from predators and drafts. You can keep your newly hatched chicks almost anywhere, their fluffy body and really small size makes them easy to handle. Even a small cardboard box can make a comfortable house for your baby chicks until they are three or four weeks old. Your box or cage should be wide enough to give each chicken proper place to lie down and move around (1 square foot per chick). Make sure your chicks’ brood has a proper ventilation system. Line the floor of the brooder with pine shavings to absorb the urine and excrements of your chicks. Hang a 100 watt light bulb in the brooder to keep the place warm. In the first week maintain a temperature between 90 and 100 degrees Fahrenheit in the brooder. 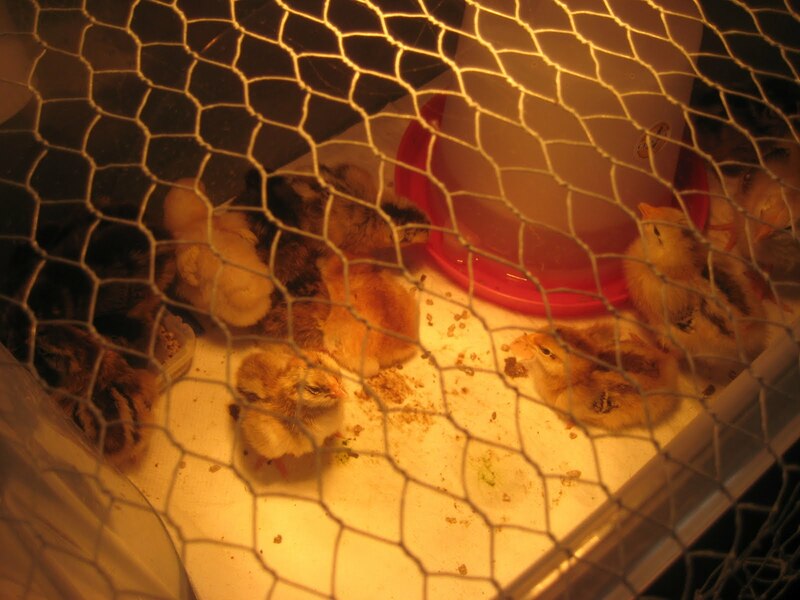 Decrease the temperature by five degrees every week until your chicks have full grown feathers. Keep water and food available at all times. Fix a medium size plastic container in the brooder and change water daily. Also keep the feeder clean to avoid illness in your baby chicks.